Status epilepticus (SE) is a medical emergency consisting of persistent or recurring seizures without a return to baseline mental status. SE can be divided into subtypes based on seizure types and underlying etiologies. Management should be implemented rapidly and based on pre-determined care pathways. The aim is to terminate seizures while simultaneously identifying and managing precipitant conditions. Seizure management involves “emergent” treatment with benzodiazepines (lorazepam intravenously, midazolam intramuscularly, or diazepam rectally) followed by “urgent” therapy (phenytoin/fosphenytoin, phenobarbital, levetiracetam or valproate sodium). If seizures persist, “refractory” treatments include infusions of midazolam or pentobarbital. Prognosis is dependent on the underlying etiology and seizure persistence. 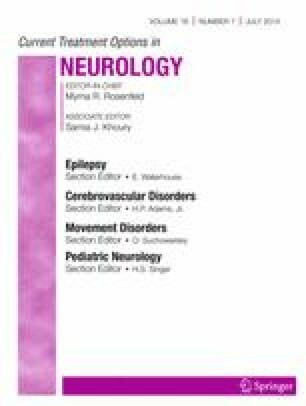 This article reviews the current management strategies for pediatric convulsive SE. Tobias Loddenkemper receives support from the National Institutes of Health/NINDS, a Career Development Fellowship Award from Harvard Medical School and Boston Children's Hospital, the Program for Quality and Safety at Boston Children's Hospital, the Payer Provider Quality Initiative, The American Epilepsy Society, The Epilepsy Foundation of America, the Center for Integration of Medicine and Innovative Technology, the Epilepsy Therapy Project, the Pediatric Epilepsy Research Foundation, the Danny Did Foundation, the HHV6 Foundation, and from investigator initiated research grants from Lundbeck and Eisai. Dr. Loddenkemper also serves on the Laboratory Accreditation Board for Long Term (Epilepsy and Intensive Care Unit) Monitoring, on the Council of the American Clinical Neurophysiology Society, on the American Board of Clinical Neurophysiology, as an Associate Editor for Seizure.